Troy Straszhelm, co-founder and CEO of Industrial Perception, switches on a blue robotic arm outfitted with some of the most advanced imaging software in existence. The robot hand swivels, pauses as if in contemplation, then turns to a mound of empty boxes stacked haphazardly on the back of a truck. It clamps one from the top and tosses it. "Catch," Straszhelm calls out. 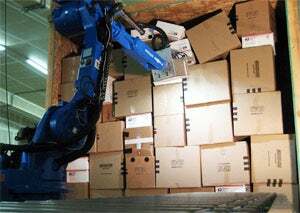 Once the kinks are worked out (like perfecting the grip so the box never falls back into the pile) human-operated forklifts in warehouses could be replaced by similar "smart" robotic arms with the ability to deal with any number of problematic scenarios in shipping: crushed boxes, illegible graphics, jumbled inventory in containers or on conveyor belts. An arm running Industrial Perception's software could potentially handle anything involving a box, even "learning" to work only when conditions are ideal. "We're working on the eyes and brains of industrial robots, on perception, manipulation, planning and control," Straszhelm says of his Palo Alto, Calif.-based company. "There's a bunch of stuff you can do with existing hardware if you have software that's smart enough." Is this the start of a robotics revolution? Is intelligent machinery the next big thing? Consider: NASA's Mars rover Curiosity was shortlisted as Time magazine's Person of the Year. Google's fleet of autonomous cars is now legal in California and Nevada, making robot taxis a near-reality. And iRobot, makers of the Roomba vacuum cleaner (going on more than 10 years in business), recently filed a patent for a potentially game-changing 3-D milling, drilling and finishing robotic fabricator, designed to handle all aspects of product manufacturing. Startup infrastructure dedicated to robotics is likewise emerging: hacker spaces (Robot Garden), accelerators (Robot Launchpad) and even a dedicated venture capital firm, New York City-based Grishin Robotics, founded last June by Russian internet entrepreneur Dmitry Grishin. Yet more proof can be found in startup garages around the country, such as Lemnos Labs, an incubator founded in late 2011 in an industrial sector of San Francisco's hip SoMa district. "We want to help cultivate people's interest in hardware," says co-founder Jeremy Conrad, a former Air Force engineer, noting that investor interest has grown because of recent exits like Kiva Systems, a maker of robots that service warehouses, which sold to Amazon for the shockingly high sum of $775 million. Lemnos, itself, has received $1.85 million, and several of its portfolio companies have obtained significant funding as well. and better than before," says Valery Komissarova, Grishin Robotics' business development director. Until recently, she says, it took about $1 million and a decade to build any kind of robot. The rise of crowdfunding, too, has made it possible to quantify user demand. Another factor is the ability to leverage technologies and advancements made in other industries. Mobile-device manufacturing has made previously expensive componentry--GPS, batteries, sensors and cameras--not only affordable but portable and more powerful. For example, Grishin has invested in Double Robotics, a Y Combinator alum producing an affordable $1,999 telepresence robot that uses an iPad as the interface, opening telepresence up to a world outside of corporations, such as for sick students who can't attend school. Co-founder David Cann says the company received nearly $2 million in orders with no advertising efforts; shipping began in March. Lower costs and greater capital efficiency are also driving the acceleration in robotics, adds Frank Tobe, publisher since 2008 of online news source The Robot Report, who has amassed a list of 2,200 companies directly involved in robotics. The trade association International Federation of Robotics predicts that more than 14 million consumer-service robots will be sold from 2011 to 2014. The industry is also being buoyed, Tobe says, by the proliferation of a common open-source robotics operating system: ROS, developed about five years ago by Menlo Park, Calif.-based Willow Garage. "Having a universal language for programmers coming out of college to use means there's no need to reinvent the wheel, and a lot more integration of ideas around the world," Tobe says. In fact, Willow Garage made the big announcement in February that it would transition from research to becoming a commercial entity. Willow's robot, the PR2, while not exactly commercially viable at $400,000, has been famously programmed to fold laundry, thus overcoming the traditional hurdle of robots being unable to "understand" soft materials. "The robotics field is coming into its own. We like it now because there are a number of extraordinarily large industries that can be transformed," says Jon Callaghan, a founding partner at early-stage tech VC firm True Ventures, which is an active investor in hardware startups, including 3-D-printer company MakerBot Industries, and 3D Robotics, a San Diego company helmed by Chris Anderson, former editor-in-chief of Wired magazine.